Relate: For the past couple days I was living in a church. I was visiting a small city nearby where I had the honor of teaching English and sharing the love of God with those that were there. There was no sign out front declaring that part of this building was the home of “First Bible Baptist Church of the Holy Redeemed Assemblies of God”. Even after coming through the front door and walking up a set of stairs, if I didn’t know better I would have thought I was walking into an apartment that had been put to other use. That is probably because I was walking into an apartment that had been put to other use. In the room we would call the main sanctuary, there were no pews. There was no podium. There were some chairs but they were stacked up and most of the time they were not used. There was just a carpet and then, lining the walls on three sides, a bunch of cushions and pillows. This church didn’t really look like any church I was used to. Except for the large cross and some of the pictures on the walls I would think it felt more like a Mosque. There’s probably a good reason for that. 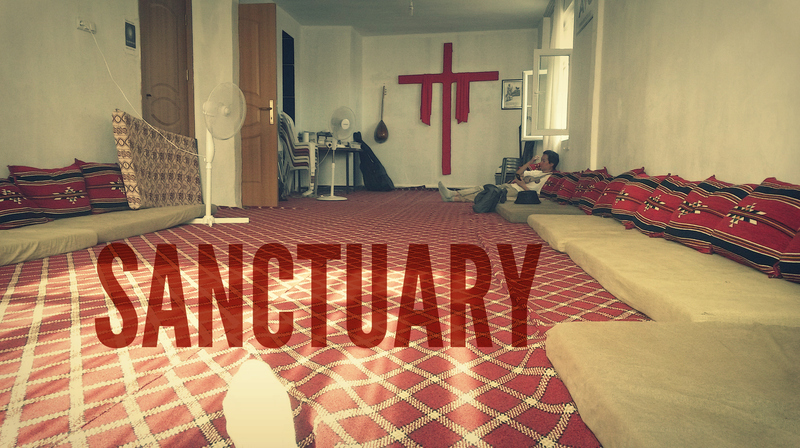 Although it did not look much like a church, it most definitely was a sanctuary. I was close enough to the border that if I were to go to one of the nearby hills I would be able to see Syria. The host pastor said to not open the doors for anyone except him or one of the other few Christians I met the first day. He also said not to be walking around but stay indoors. Basically, it was not safe for us foreigners anywhere in the city, except in the church. React: One of the major paradigm shifts from the Old Testament to the new was the sanctuary, or the Temple. In the Old Testament it was a building. In the New Testament it is us. That brings up two questions: 1) Am I a sanctuary? Am I a place of refuge? When people come to me can they find safety from the harsh and hostile world or am I part of the problem? The Proverb for the day tells us to avoid gossipers. When people come to me sharing their business do I spread it around to whoever would listen? Am I a sanctuary or am I part of the problem? 2) Do I truly love the sanctuary? In general I am a pretty loving person. I can’t say I am perfect in this regard, far from it, but over all I believe God has blessed me with the ability to love His people well. What about when I look in the mirror? Just as much as my neighbor and my friend, I am His sanctuary, the place where His glorious presence dwells. I am not talking about some Oprah Winfrey, New Age, love yourself psycho babble. They take a Biblical truth and run with it so far it becomes idolatry. That doesn’t mean there is a core of truth to it. God loves me enough to die for me. Do I love what God loves? Sometimes, when I look at inside I am astounded that You would chose to make Your dwelling in me. Sometimes I don’t quite look like what You would expect a sanctuary to be. Help me to see me as You see me. Help me to live up to and continuously move toward what You would have me be. Let me be, through my words and my actions and Your love, a sanctuary for those around me. Let them find shelter with me from the harsh and hostile world around them so that ultimately they might find You. Truly, we should read this very post at the beginning of each new day! Thank you so much for writing this! Good question and one we all need to answer truthfully be the help of the Holy Spirit from time to time. If we constantly examine ourselves in the light of the Scriptures, what a transformation the Kingdom will see. Lord help me to be a real Sanctuary, a place for you to dwell, for brethren to find encouragement and the world to see the light in Christ Jesus mighty name. Amen. Thanks so much for this piece. God bless you. Thank you so much for reminding us today how central our role as sanctuary is, and what that looks like in everyday life. Let me have trust in you Lord, so that I can be your true disciple that you want me to be. I agree with what he said about our neighbors coming to us and seeing us be their temple because I have personally have had that experience, it’s pretty awesome knowing that when people are in trouble that they come to me to ask for prayers. It makes me feel so great and rich in God’s love. As you all know, I love all of my followers and I truly care about all of you and I pray for you everyday. I like the picture, it looks so peaceful. Thank you so much for sharing insights into your ministry on the frontlines! You have a way with descriptions that gives the reader a great sense of what you must be experiencing and a keen ability to tie it into a lesson for the daily lives of those of us in a more secure environment. Me and mine continue praying for you. For protection to to be sure but more importantly for Gods grace, His Spirit and His love to flow through your willing hands to the people you come in contact with. God bless you Bro. Thank you. I’ll take all the prayers you want to send up. God speaking through you! Bless you and Bless the Lord oh my soul! Must I wear a cross for people to recognize I am a child of God? Must I wear a cross to identify myself as a Christian? May the Lord open my eyes that others are looking at me wherever I am. May the Lord help me to look on Him who sanctifies me to be His witness on this earth. Amen. This is beautiful, thank you. Love the inner and outer sanctuaries.